H&M presents a collaboration with fellow Swedish fashion brand Eytys, based in Stockholm. The fashion insider brand is known for their streamlined yet chunky-soled shoes, unisex approach and perfectly designed wardrobe staples. The Eytys x H&M line will feature genderless shoes, clothing and accessories for adults and a selection for kids, designed in collaboration with the H&M in-house team and available in selected stores worldwide as well as online from today on. The Eytys design approach and overall ethos are rooted in the digital age, but also in freedom from restraints based on gender or age. Together the brands have extracted the core of Eytys DNA and developed a unisex collection featuring a no-fuss and fashion-forward range of shoes and clothes. The line includes sneakers, shoes and boots in leather, suede and cotton canvas along with jackets, tops, trousers and jeans in materials such as cotton twill, faux patent leather, nylon and raw denim. Designed together by the H&M in-house team and Eytys, all the shoes have the distinctive Eytys sole, while the clothes have boxy silhouettes and don’t distinguish between garments for women or men. Snakeskin print, shiny faux patent leather and supple suede are mixed with stiff cottons and humorous graphics. The colour palette consists of bottle green, school bus yellow, beige khaki, dark indigo, black and white. Everything can be effortlessly mixed and matched to suit any mood and allows the customer to really showcase their confidence in themselves and their style. Each pair of shoes comes with a custom-designed box featuring a unique artwork by painter Zoe Barcza. “With this collaboration, we hope to introduce the H&M customer to our design philosophy of robust and fuss-free design where function triumphs embellishment and styles spans genders. The collection is all about proportions creating a distinct unisex silhouette by playing around with loose silhouettes and chunky architectural footwear. 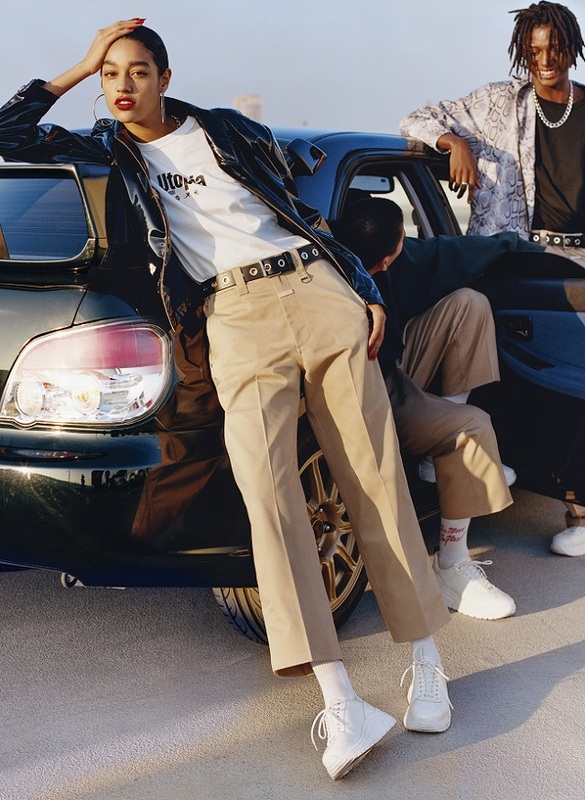 It’s the Eytys idea of a ‘generic’ look, one that is meant to elevate integrity, attitude and confidence,” says Max Schiller, Creative Director at Eytys. “We admire that Eytys have a look distinctly their own and initially approached them with the idea of creating a shoe collection. But after initial brainstorming, it was decided that a full collection – shoes, clothes and accessories would enable our customers to really experience the whole brand aesthetic and ethos. With this collaboration we want to offer our customers a total look that is all about chunky statement shoes and mindful proportions that are genderless,” says Ross Lydon, Acting Head of Menswear Design at H&M.